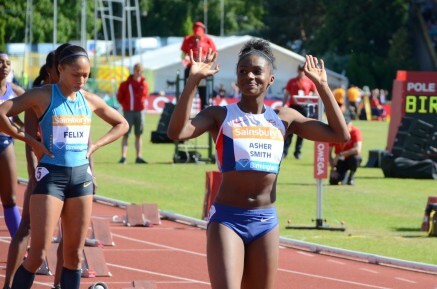 5th July 2015 – At the British Championships and World Championships trials Dina Asher-Smith (GBR) and Stephanie Twell (GBR) were a class apart in their respective events. Having broken the British 100m record earlier in the season Dina started the event as favourite and after a dominant display in her semi-final only enhanced that tag. She duly delivered in the final running a championship record 11.08 seconds to win by over three tenths, and take her first senior outdoor title. Steph’s performance was far more about patience as she bided her time towards the back of a large pack in the 5000m initially, then mid-pack for the majority of the race before unleashing her own kick finish to break away. Her winning time of 15:38.01 was run in horrendous conditions but with a final kilometer of 2:51 she will take confidence that there is a lot more to come. Defending World Champion Christine Ohuruogu (GBR) and Michael Rimmer (GBR) both took silver medals in their respective events having both had injury interrupted seasons thus far. Both have time to build on these performances over the coming weeks. Chris Tomlinson (GBR) was fourth in the Long Jump and Tom Lancashire (GBR) took sixth position in a competitive mens 1500m. At the Brussels Grand Prix, 2011 World Champion Vivian Cheruiyot (KEN) ticked off the first box for selection for this years championships by the running the 10,000m qualifying time. Needing to run inside 32:00.00 Vivian clocked 31:13.29.